Child of Nod by C.W. Snyder. Curiosity Quills Press, 2017. Ebook. 274 pages. "Once upon a time, there was a girl who was dead." That opening line had me hooked immediately on this book and is pretty much what made me know that I wanted to read it. Going into this book, I wasn't really sure what age-range it was being marketed towards, but I assumed it was possibly young adult, although the cover could have been anything from middle grade to adult. I have to say that this is definitely not written for kids and leans heavily toward the adult side, which was perfectly fine with me (I'm always ready for more Alice retellings at any age range). It's definitely dark and also rather creepy, so if that's not your thing then this book might not be for you. This is a very atmospheric book that focuses a lot on descriptions, images, and emotions. There's not a large amount of action, but the narrative itself is still surprisingly gripping. That being said, there is still plenty of plot development and this book was never boring. 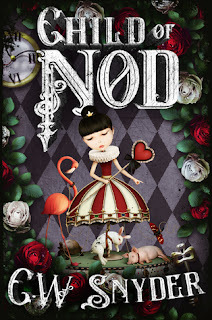 Child of Nod a slow-paced book that seems to focus more on development of the characters themselves than it does on large events. Alice herself was a particularly intriguing character. The weird thing about this Alice is that about halfway through I realized that we, the readers, never really get any backstory about her life because she can't remember her past. It's not often that I read books from the perspective of someone who we don't really know much about, and I was also surprised that it didn't really bother me at all. I enjoyed getting to know Alice based on her present circumstances and how she reacted to things as they happened to her. 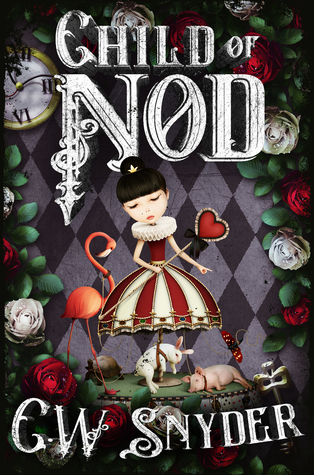 Alice is sweet, but there's much more to her than that; she's exceptionally curious and eager to find out exactly what she's doing in Nod. There are a couple of other characters that this narrative focuses on that were extremely interesting figures to follow. I did find myself slightly confused at times when trying to remember the identities of various characters and occasionally forgot who was who. This might not have been a problem if I had been able to easily check back to figure out who was who, but since it was on my Kindle I couldn't do that easily so I just kept reading until I got the hang of things. I still really enjoyed reading about the backstories on these characters, and it's within these backstories where some of the darker and more horror-esque moments occurred most often. Snyder's prose is beautiful and is able to convey so much passion in such a short amount of time. Books that focus heavily on descriptions and journeys can sometimes be hard to get into, but I found myself riveted by Snyder's words throughout the entire story, something that proves to me that author knows how to write and craft an intricate, captivating story. Child of Nod is a book that I still need to think about and consider the themes and what this book was meant to be about. I also think that this is one of those books that I would prefer reading as a physical book because I kept wanting to go back and check thing or just reread certain parts, in addition to the fact that I personally find atmospheric and description-heavy books are just easier for me to read. Regardless, Child of Nod will definitely make you think and it is one that I do recommend. Overall, I've given Child of Nod four stars! That is most definitely a promising opening line! I hadn't heard of this one before so thanks for the heads up. It sounds right up my alley! Wow, this is an intriguing book. When I first read the title, I was thinking it was probably a middle grade book but I'd say definitely not after reading your review. It sounds fascinating though and that first line definitely grabs your attention. I love retellings so thanks for putting this one on my radar!